The sound of raindrops is perhaps the most bewitching interplay of natural elements on this planet. It is the sound of reassurance that life is going on normally. A note of reaffirmation that billions of life forms will thrive, seeds will sprout, buds will bloom, little birds will grow wings and leave their nests, kids will giggle and play with muddy water, so on and so forth. It also tells us that there have been millions of rains before we came and there will be millions more after we go—reminding us of the infinitely minute role we play in this universe. To put it simply, it’s one of the most important links in the chain of life that has no beginning or end. But such a soothing stream of thought can belong to an abode on the 11th floor of a residential complex fitted with its own state-of-the-art water treatment plant. Certainly not to this realm of horror called Mavallipura where some never-seen-before ghosts have pitched their tents on the Rotting Hill with vultures hovering over it relentlessly. They don’t even have to wait for nightfall to skulk around with their faceless hoods. They are more than a decade old already. And, they are here to stay. Heavy rains trigger nonstop dread among the villagers living in Mavallipura and 16 other villages surrounding it. Gusty winds kick up dust from the landfill and carry it afar. Each droplet from the skies brings misery that none of us can come close to comprehending. No wonder why no rains are welcome here. No breeze either. A notice painted by the Zilla Panchayath stating that the water from this borewell is polluted and advises the commoners against using it. According to an estimate, nearly 40 lakh tonnes of mixed hazardous garbage has been dumped in Survey No. 8 of Mavallipura over 10 years between 2002-12. The leachate—loaded with a deadly cocktail of chemicals and greenhouse gases—bubbles up between layers and layers of this mess, leaks into the groundwater table and travels far and wide and deep. Downpours only help it seep and move around swiftly underneath. Suddenly it felt as if the landfills have cut the Bangalore population, already riven with divisions, into two classes: Those who dump, and those who get dumped. The State Government’s decision to reopen this landfill as an alternative to stop dumping at Mandur from December 1 has taken away even that fiction of hope of a future with no further damage. In Subedar Palya, a short drive from Mavallipura landfill, a borewell dug deep at 1,120 feet spews out a constant stream of black water. A notice painted on a wall by Zilla Panchayath says the water is polluted and advises people against using it. The villagers have kept an array of bottles filled with this water on a compound wall showcasing the disaster. If anything’s missing from these bottles, it’s some dead specimen with their heads hanging down and limbs pinned to a wall. Srinivas accompanied me to the spot and got the borewell started. Initially, it looked like Mountain Dew. When I smelled it, it instantly transported me to a hospital waste dumpyard. An ill-timed power cut halted the demo (TOI published a picture of the black water collected from this borewell in yesterday’s edition). 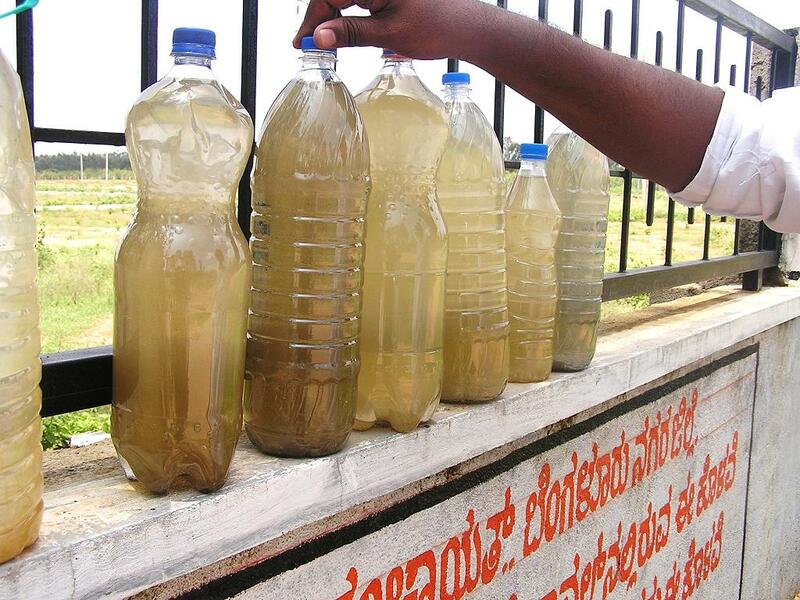 It is this stinky water that villagers are forced to drink. Not all of them can afford tanker water, of course. “We can buy water cans for drinking. What will we do for bathing, what about my cattle, my goats?” questions Jayaramu whose nine-acre strip adjacent to this borewell has been rendered infertile. “Site for sale” scribbled with red paint hides many subtexts. The same is the fate with another 11 acres his family owns. In a world where justice has its way, any farmer with 21 acres of land would have been dealing with problem of plenty. But not this “plenty”. “Hotte ureethadamma (my stomach burns, amma…),” he cries and brings one medicine bottle after another prescribed for him and his ailing mother to soothe burning eyes and stomach lining and swollen legs. 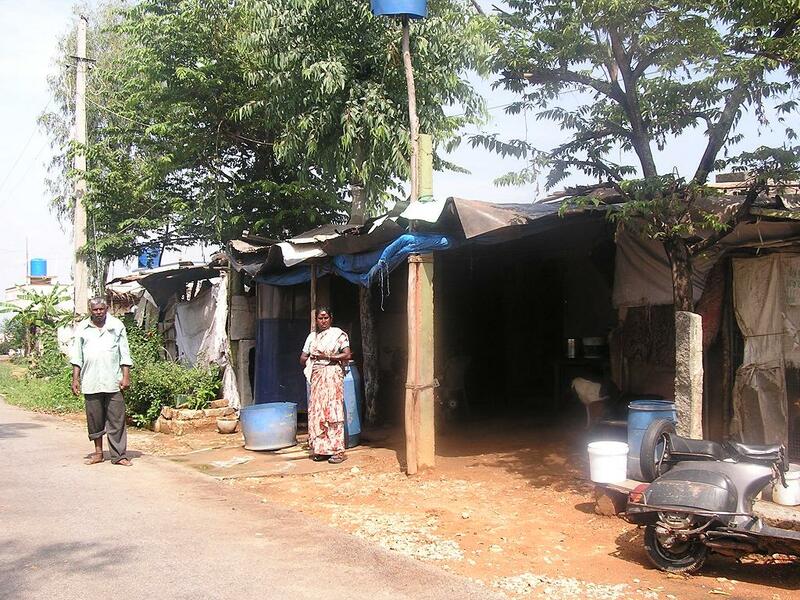 Mallappa and Vijayamma in front of their house located right in front of the landfill. Mallappa and Vijayamma built their house with a lot of difficulty. “The earlier one was too cramped.” But this home they so proudly own woke up to a grotesque parade of 250 trucks one fine morning. They said that in many areas the water curdles and a creamy layer floats atop when boiled. A little while later blackish sedimentation sets in. Ramesh of Kurubarahalli also concurred with this. “We advise the villagers to boil water for at least 20 minutes before drinking,” adds Srinivas. Yet another reminder that Bangaloreans did not do what was well within their control! This entry was posted in Endlessly Green, Free Flowing and tagged Bangalore landfill crisis, landfilling, polluted borewell water, Water pollution in Mavallipura landfill. Bookmark the permalink. Cruel, more so because it us completely man made and absolutely avoidable! We must fight this and not allow garbage to be dumped in Mavallipura. They have suffered for 10 years and they cannot just be made to suffer all over again. They saw relief in terms of stoppage and are still paying for the 10 years and to go and dump on their head all over again is the ultimate in cruelty. Let the CM try dumping mounds of garbage in his backyard and try and live with it. You have showed how true, well-directed determination can shut down a polluting factory single-handedly! Thousands of people are being benefited from your dogged efforts. And, they don’t even want to know who did it (!). So where’s the question of listening to the woes of this suffering lot and doing something about it? Yes, the fight has to begin and the villagers have to be supported. They will get a shot in their arm if we join their hands and share their agony. Dumping here or in Mandur will go on so long as there is a landfill waiting to take it. If Mavallipura remain shut, Mandur protests will get more strong and hopefully, it will also be shut down. Willing to support in any manner physical protest to fasting or lying down before the dumpers and whatever give the call and will be there. great initiative Savita. This is exactly what you should be doing – be on the top table and play a bigger game. Well written and biting article. Hope the educated class wakes up and stop this indiscriminate dumping.